Happy Labor Day weekend! I hope you are all having a great time enjoying this last summer holiday! Maybe you’ve had a chance to fire up the grill this weekend or perhaps you’ve already moved on to the comfort foods of autumn. I have done a little of both. In my head (and in my stomach) I’m already craving those comfort foods–like roasts, homemade bread, creamy polenta baked in the oven…but at the same time, it is still summer, and we in the Southwest have about two more months before we begin to feel the first twinges of cool Fall weather. So, today, I landed on a happy medium. 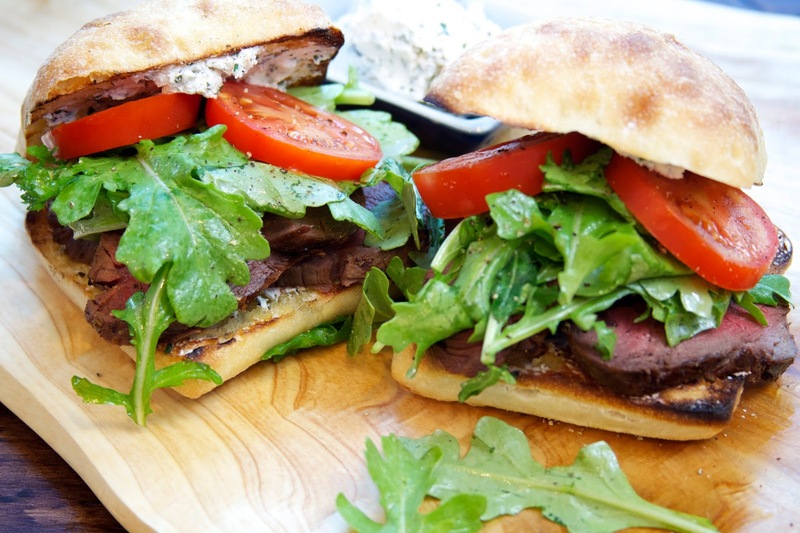 I still got my roast, but made it on the grill, sliced rare and piled on a toasted ciabatta roll topped with goat cheese laced with fresh herbs and a nice handful of peppery arugula. 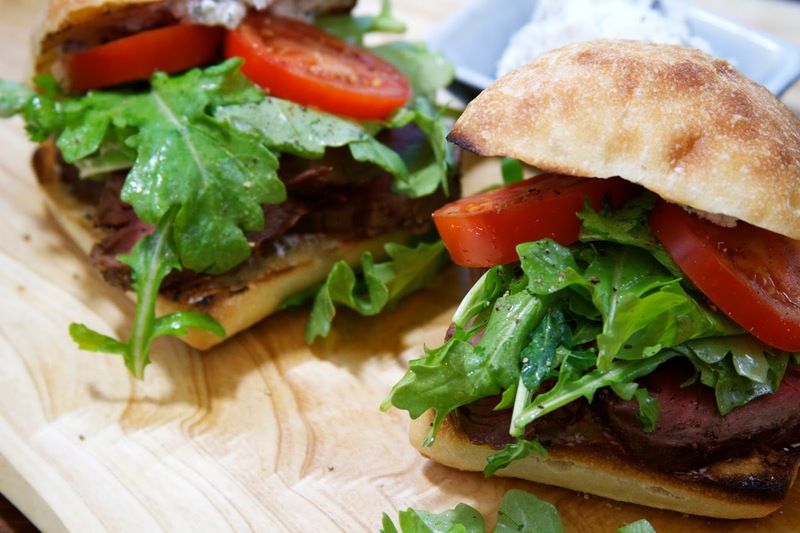 The inspiration for this sandwich comes from the “Barefoot Contessa, Back to Basics” cookbook. 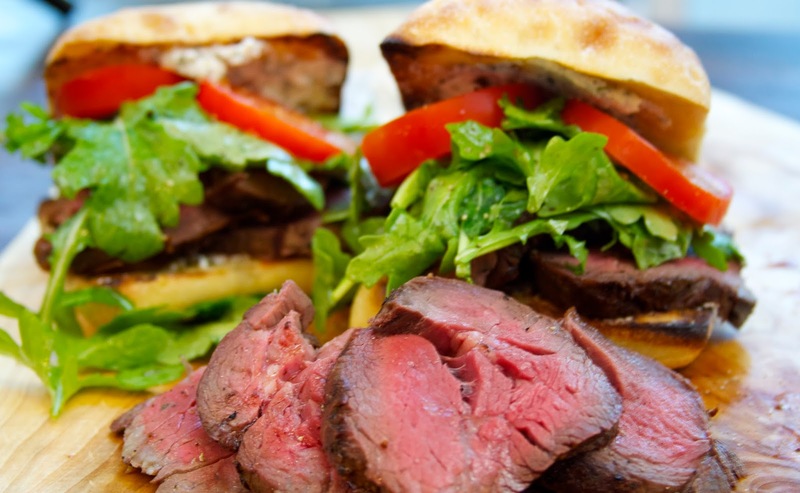 I tend to make this sandwich for special occasions, simply because the main ingredient, filet mignon, tends to be expensive. I purchased the filet from Costco and it comes in a four to six pound loin. It does takes a bit of butchering to remove the excess fat and silver-skin, but it’s the most economical way to purchase this expensive cut. I like to divide it into 1 pound portions and freeze it. 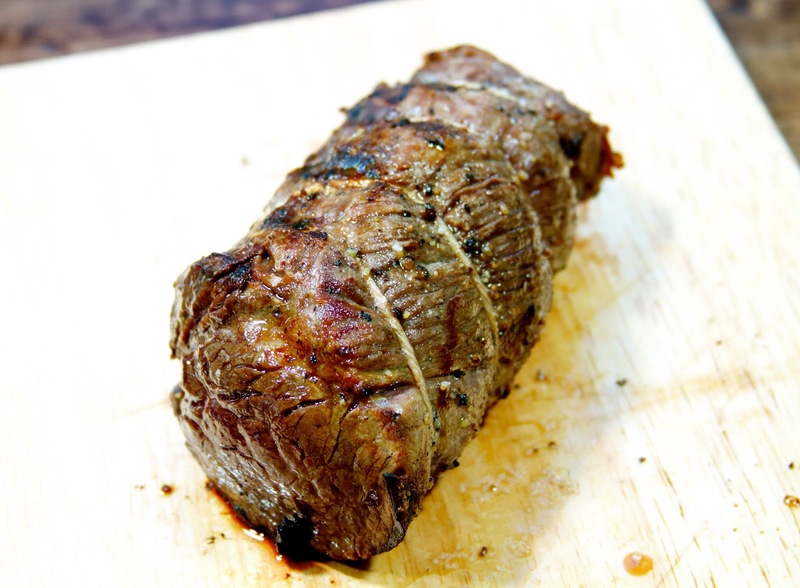 It might be more convenient for you to purchase a beef tenderloin from your butcher in a 1 to 1 1/2 pound roast. I used a 1 pound portion of the loin, which is enough for three to four sandwiches. Preheat your grill on high heat for direct grilling. Alternatively, you can make this roast inside in an oven preheated to 500 degrees. As you can see, I trussed the roast with cooking twine to keep its shape. Allow the meat to come to room temperature before cooking. Pat the meat dry with a paper towel, then season the roast generously with salt, pepper, softened unsalted butter (decadent! ), or brush it with canola oil. Place the roast on the grill, or if cooking in your oven, on a grated roasting pan. 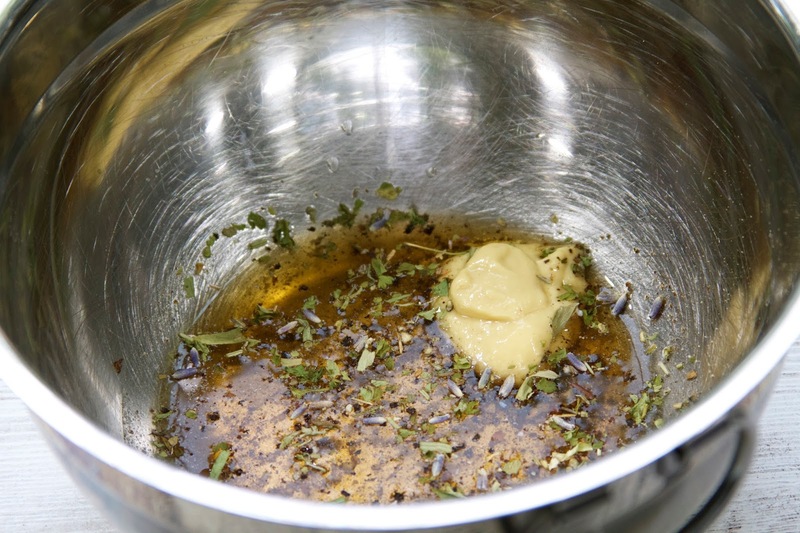 Allow the meat to sear on the one side–about 5 to 7 minutes, then turn the meat and cook on the other side. I like filet rare to medium rare, so I cooked this roast for approximately 18 minutes total since my grill was set around 550 to 600 degrees. If you are making this roast in the oven, there is no need to turn the roast. In a 500 degree oven, a good guideline is 22 for rare and 25 minutes for medium rare. After the roast has finished cooking, cover it tightly with aluminum foil and allow it to rest for 10 to 15 minutes. 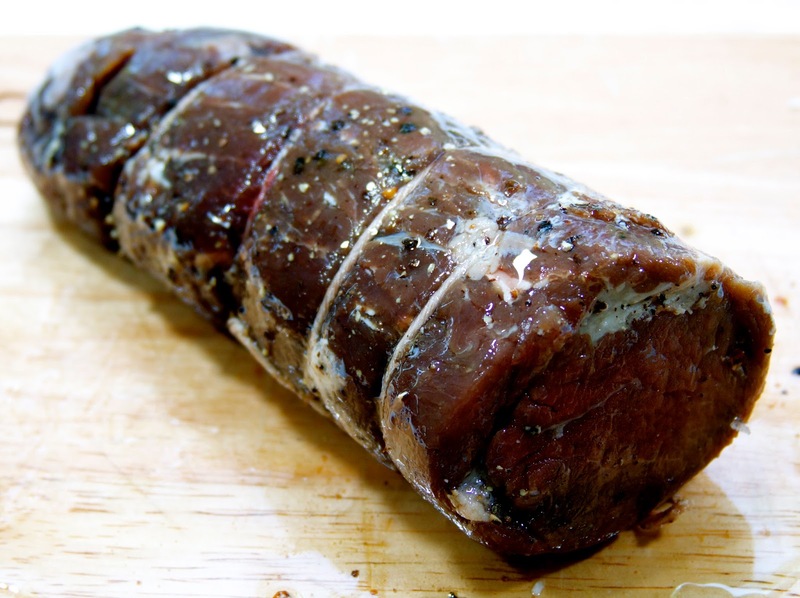 Don’t dare cut into that roast before it has had a chance to rest–this allows the juices to reabsorb into the meat. If you don’t allow for a rest period, the juices will all leak out and you will be left with a dry filet mignon, which would be a tragedy! After the meat is done resting, slice in 1/4 inch slices. The original sandwich calls for a spread of truffle butter and freshly shaved parmesan. Since truffle butter is an ingredient that necessitates a trip to a specialty store, I tend to skip it altogether. 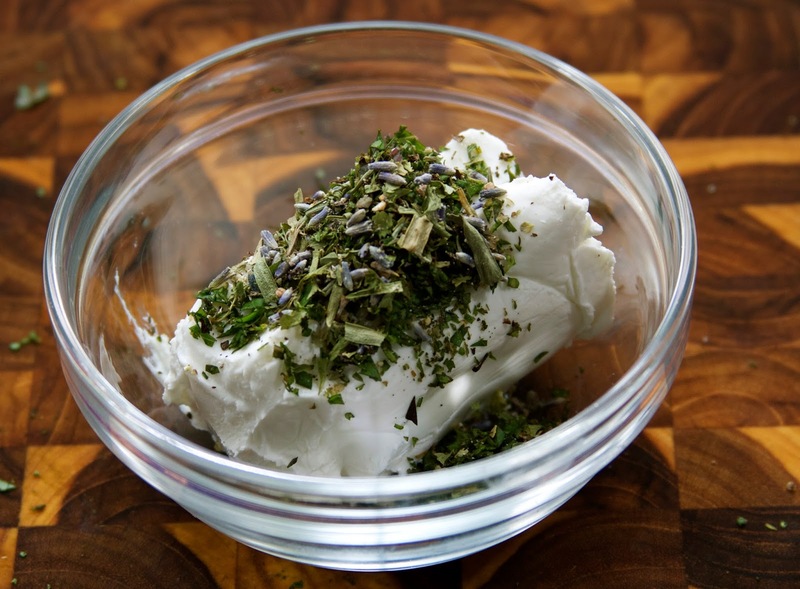 I simply used a small package of goat cheese, mixed in fresh and dried herbs and spread it on the sandwich. It couldn’t be easier! 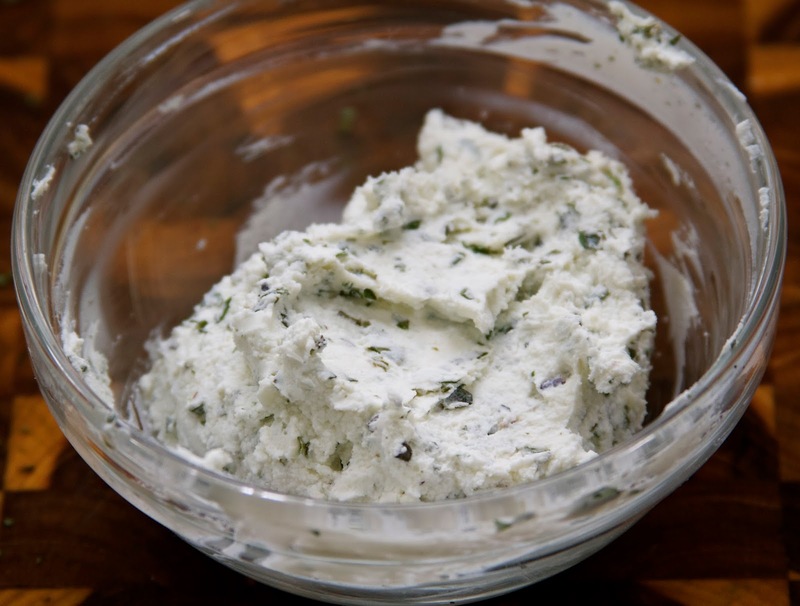 Allowing the goat cheese to come to room temperature makes it soft and easy to stir in the herbs. 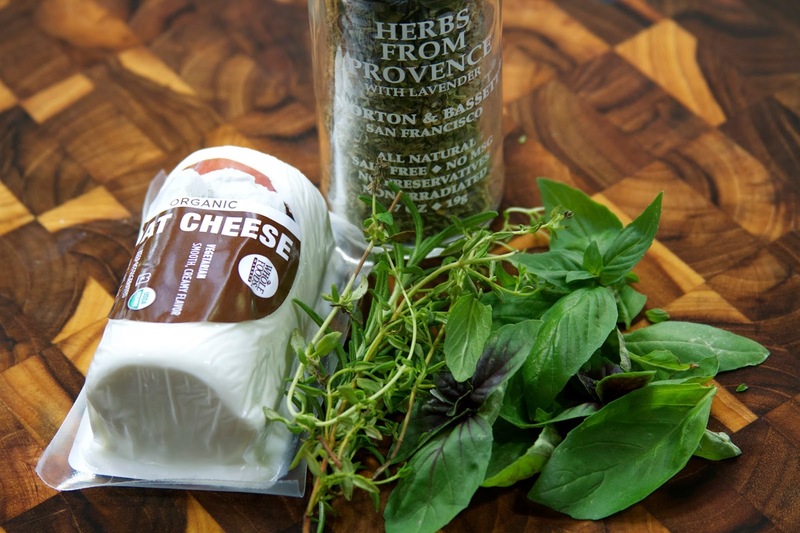 fresh herbs: rosemary, thyme, basil, parsley, whatever you have on hand! Finally, the sandwiches were topped with a handful of peppery, wild arugula that was dressed in a simple vinaigrette of white wine vinegar, dijon mustard, honey, olive oil and more Herbes du Provence. 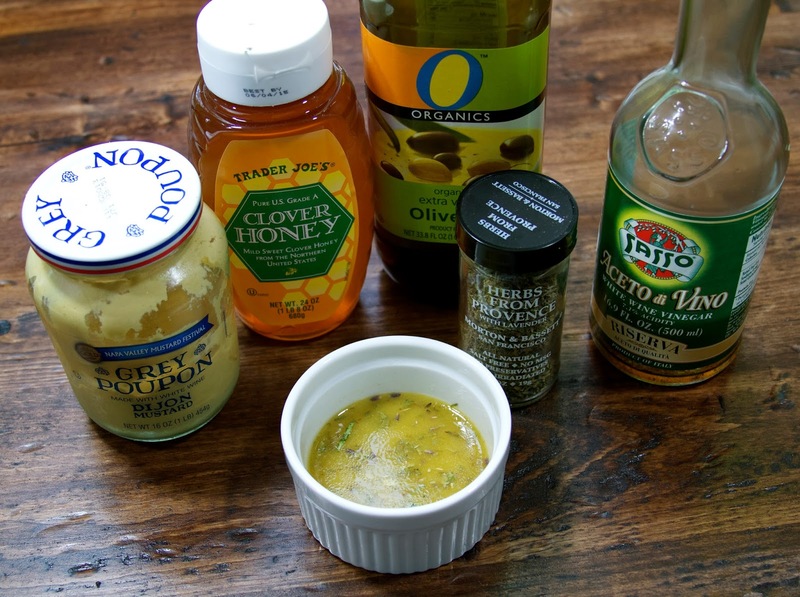 Whisk together the vinegar, dijon mustard, honey, herbes de Provence, a pinch of salt and pepper in a mixing bowl; then slowly pour in the olive oil, whisking until the dressing is throughly mixed. Lightly dress the arugula with the vinaigrette. Enjoy with a a nice glass of wine and a good eating partner!